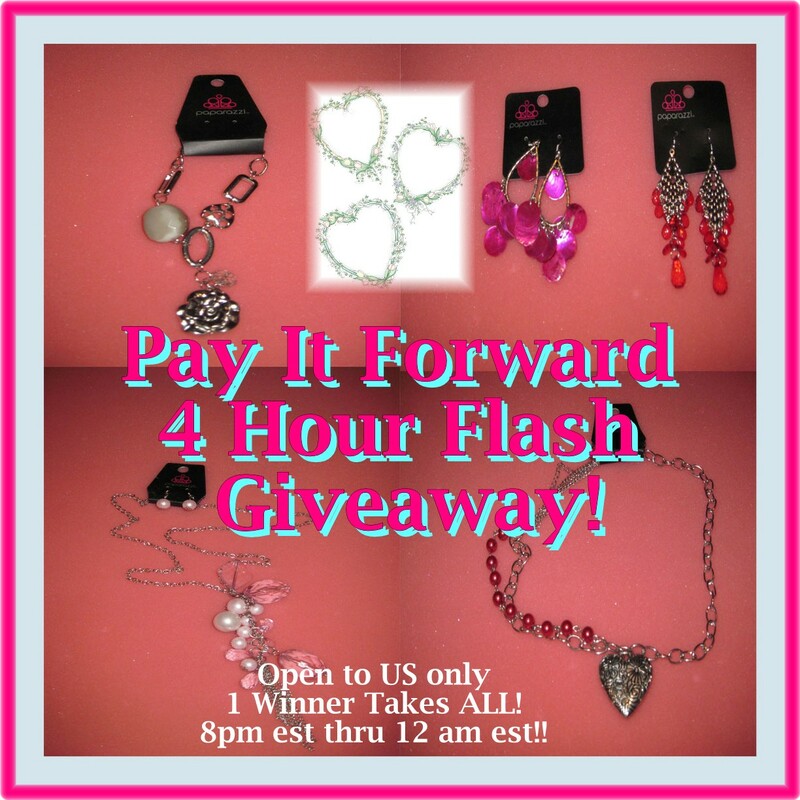 Welcome to a 4 hour Pay It Forward Wild Wednesday Flash Giveaway! You just have 4 Hours to enter this giveaway to come away the winner of everything you see in the picture above all provided by Paparazzi Accessories by Glitz Gallery! 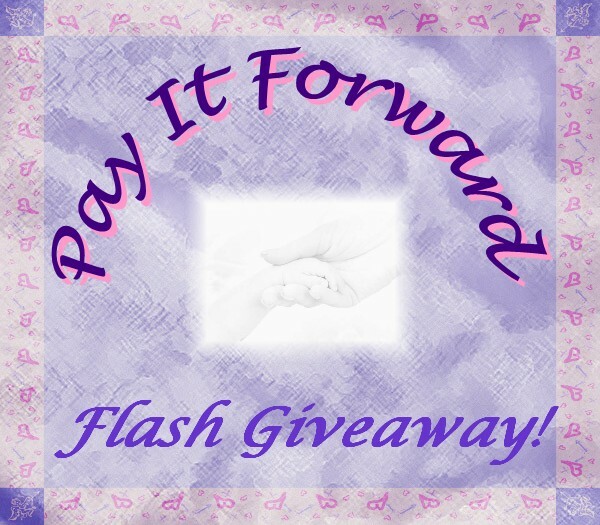 We LOVE to PAY it FORWARD to our Amazing Fans! My favorite piece is from my Great, Great, Great Grandmother who was from Englund. It is a 24K gold wedding band. Yes, it’s plain but it has much much meaning to me! My wedding ring that has a diamond in it that my dad gave me. So special. I left pretty much everything I owned in Ohio when I moved so I dont own much but i do have one silver tomahawk necklace from when my family and i went on a trip to natural bridge that i LOVE! A retro bracelet a friend found at a thrift store… so beautiful! My fave piece of jewelry that i own is my 14kt gold cross necklace and my engagement ring. My favorite piece of jewelry is my wedding ring followed by my necklace that has my two babies on it. Love them both!! White gold cross with diamond in center pendant that was my mother’s. A necklace my mom gave me that her mom had given to her. A little fake ring with a yellow stone that my grown son (32) yrs old now. Bought me at a school christmas bizarre, when he was 6 yrs old. It means so much to me because he was so proud of it when he gave it to me for Christmas. He thought it was real. My favorite piece of jewelry is my wedding rings because the man I love more than my own life gave them to me!! A dinner ring my daddy gave my mother. My favorite piece of jewelry I own is my gold hoop earrings! My favorite jewelry is a pair of earrings my grandmother gave to me several years ago. A butterfly necklace my sister bought me from an antique store! My favorite piece is my wedding ring and bracelet. My gorgeous wedding ring ! Anniversary ring from my hubby of 40 years! My Great Aunt Leona’s skeleton key necklace. My favorite piece of jewelry is a strand of pearls my husband gave me for Christmas when we first married. My wedding ring. My husband got it when we were broke and he paid what he could. We are better off now and I still won’t let him replace it. In my heart it is not replaceable! When I look at it I remember how hard it was to get to this point in life ! Keeps me humble! My favorite piece of jewelry is a really nice strand of pearls that my husband gave me for Christmas when we were first married. A Greek pendant I wear on a gold cord. A garnet ring my mother gave me. I don’t have a favorite piece. I treasure the most a beautiful Mother and Baby necklace that my daughter bought me. She has bought me many beautiful pieces of jewelry, but this one my favorite! My favorite piece would have to be my wedding ring and then I have a small gold cross necklace that I love. thank you for this giveaway.